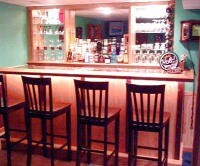 This cool custom bar layout is inspired by our site members who combined our standard home bar designs with our EHBP-11 3 in 1 Oak Bar Back home bar back project. It’s simple and yet can be laid out in several different ways. 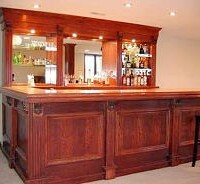 It’s very simple, first build the bar of your choice, then build the bar back, arrange and attach. 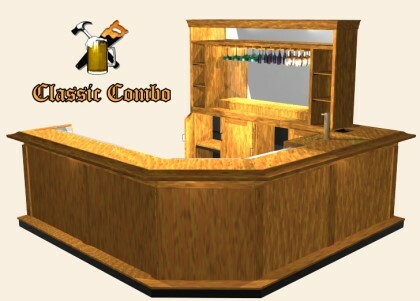 The Combo Bar layout is forum based and simply involves building the bar and bar back and mating them to create the combination layout. 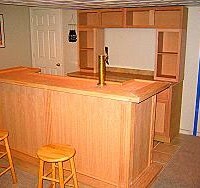 While this project might look like it requires a high degree of woodworking skill, it does not. 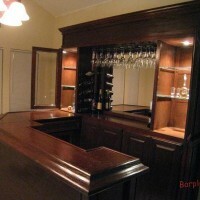 This classic combination project can be built easily by anyone with basic woodworking skills. 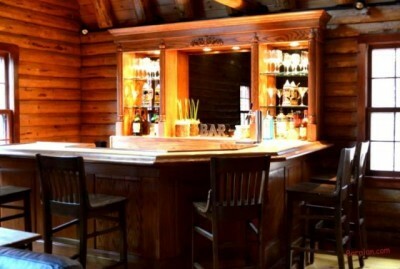 Being that this project is so variable and can include several different plans, this project is FORUM based and offered as a guide to laying out your own custom bar using one of more of the plans offered on our site. Surprisingly most of our members figure it out on their own, but we’re here to help in case you run into a snag. Estimated cost to build: ~$600 varies depending upon configuration, materials and budget. Plan Size: variable – requires 8’x12′ open floor space. 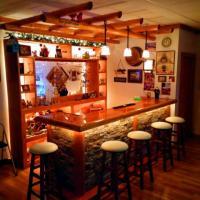 Uses existing plans – full support and addendum’s located in the Builder’s Forum. 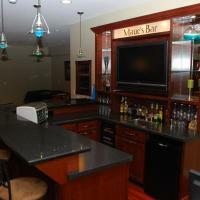 A complete modern classic home bar layout. 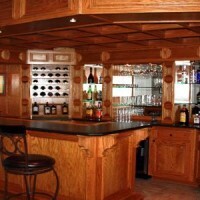 Start with either the Standard Straight Bar or L-shaped Bar, L-Shaped Wet Bar or 45 Degree Wet Bar plans, size it to your available space then match it up with our customizable bar back project. 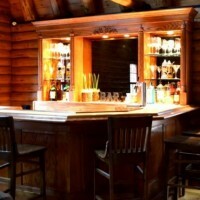 Bar accepts standard residential sized kitchen sinks, ice bins and speed rails and all standard kitchen appliances such as dishwashers, Kegerators and compact or medium sized refrigerators and wine chillers. Easily build optional storage drawers, shelves bins & cabinets. 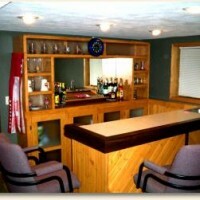 Pre-made bar arm rail moldings are recommended for this project. 8 1/2 feet x 10 feet! That’s 18 feet of seating space! 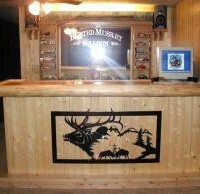 Left side of bar intended to be attached to a wall. 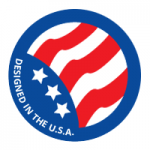 Design is symmetrical, works for either right or left handed layout. 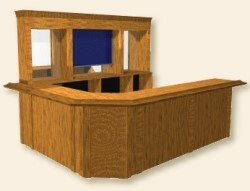 End cap design is variable – shelving options are variable. 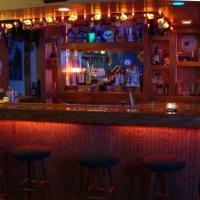 Bar back height and section sizes are variable. 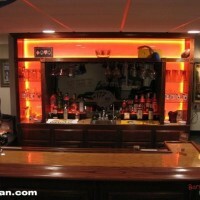 Bar skeleton framing allows you to run electrical, water and drain lines behind the bar walls and floor. 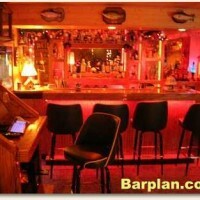 All bar plan blueprints are available for instant download. 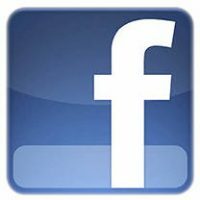 All plans documents are in universally accepted Adobe PDF format.